A major effort is under way to offer support to young people impacted by the three deaths at last Sunday's Greenvale Hotel disco in Cookstown. Police have said as many as 400 young people were outside the venue as the tragedy unfolded. Many more are now grieving the loss of three friends. But what are the signs of distress that parents and carers should be looking for - and what can be done to help? In the days after the Cookstown tragedy, specialist counsellors were sent into local schools to offer support and youth centres opened their doors for young people to voice their feelings. Other events such as the Manchester Arena suicide bomb attack in 2017, last Friday's terrorist attacks on two mosques in New Zealand and school shootings in the United States have all left children and young people suffering from psychological after-effects. The Royal College of Psychiatrists has a webpage containing advice for parents and carers of children suffering from traumatic stress. 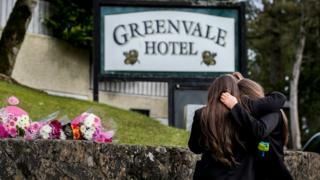 A multi-agency group in Cookstown - which includes Mid-Ulster District Council, health organisations, the police, education and community groups - has issued advice to parents of young people affected by events at the Greenvale Hotel. The advice, prepared by psychologists and psychiatrists who work with children and young people, says experiencing some distress after a traumatic event is entirely normal. "This might include difficulties sleeping, thoughts and memories of what has happened popping into mind, bad dreams, irritability, feeling low, behavioural problems and avoiding activities they used to enjoy," it says. The experts advise that parents and carers should not avoid talking about what happened, and it may help to actively encourage the young person to discuss their experience. If the difficulties persist, parents are advised to seek help from the school or a GP. Phil Lindsay of Barnardos NI said many young people "will be experiencing a fight, flight or freeze response, as a result of shock". "Encourage the young person to talk about their experience and ensure they still have routine in their lives around eating, sleeping, going to school and keeping up activities," he said. In the immediate aftermath of the Greenvale deaths, Northern Ireland's Education Authority (EA) sent staff from its "critical incident team" to five local schools. EA chairwoman Sharon O'Connor said her organisation had also provided support and advice to a further seven schools in the area. "The EA Youth Service has opened its facilities at Ógras Youth Club, Coalisland, Dungannon Youth Resource Centre and Cookstown Youth Resource Centre in order for young people affected by the tragedy to engage with youth workers," she said. Following the attack at the Ariana Grande concert in Manchester, the NHS set up a Resilience Hub to support the many children young people and adults directly affected by the traumatic event. The hub's ongoing work includes group events across the north of England and Glasgow to offer advice and help. In October 218, the hub was supporting more than 3,300 individuals - an indication of the sheer scale of the Manchester attack.